A father and son dreamed of starting a battery manufacturing business in post WWII. In 1947 their Deka brand of batteries was born. From that time, East Penn Manufacturing Co., Inc. has experienced decades of phenomenon growth through innovation, new ventures and plain hard work. Today, with more than 8,000 employees and 450 product designs, East Penn Manufacturing has a truly global footprint including East Penn International in Wujiang, China and products in more than thirty countries. They have earned an impeccable reputation with multiple industry awards from the likes of Honda, NAPA Auto Parts, Caterpillar, Daimler Truck N.A. and O’Reilly Auto Parts, to name a few. The East Penn Manufacturing corporate brand had not changed significantly since the 1940s, so CrossRoads Studios was honored to be asked to work with their management and marketing team to explore opportunities to clarify and strengthen their corporate message. Along with a detailed brand audit and competitive analysis, CrossRoads Studios conducted extensive interviews with management, employees and retail partners. A few items became clear, East Penn Manufacturing Co., Inc. had a multi-level corporate brand messaging challenge. Its very successful Deka product line overpowered the East Penn Manufacturing corporate brand. While their Deka brand was universally recognized, Deka could also be a competing brand to East Penn Manufacturing’s private label retail partners, like AutoZone. Many of East Penn Manufacturing’s competitors, like Johnson Control and Remy Battery, had much stronger corporate brand recognition. The East Penn Manufacturing logo was often viewed as “just type”. Therefore, it was often de-constructed and altered, degrading an already inconsistently applied corporate brand. Simplify, focus and strengthen the overall East Penn Manufacturing corporate brand footprint. Transition from a brand (Deka) centric organization to a strong corporation (East Penn) with excellent brands. To support a unified message, provide an overriding “one voice family” message or essence statement. With recommendations approved by senior management and the marketing team, CrossRoads Studios developed a simplified evolution of East Penn Manufacturing Co., Inc. to East Penn. The highly recognizable Deka orange was also incorporated. East Penn’s creative team introduced the iconic East Penn diamond (representing the four company divisions of Starting Lighting Ignition/SLI, Industrial, Stationary and Diversified). 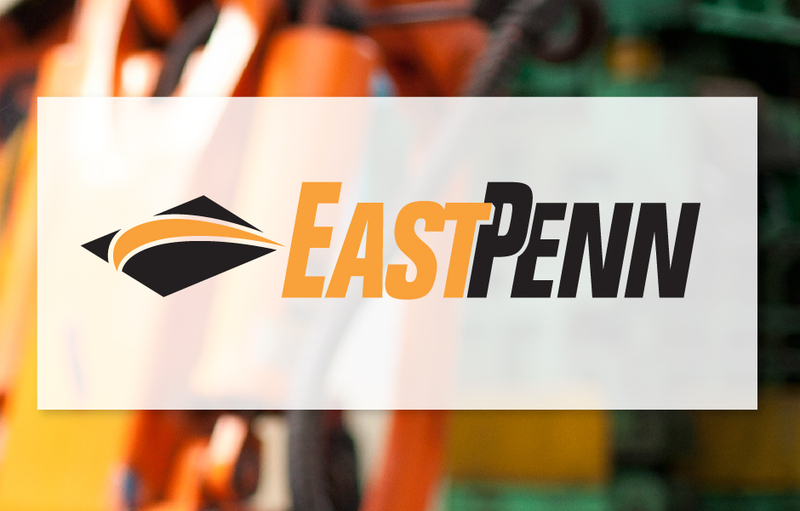 The new East Penn Manufacturing corporate brand offers a fresh, dynamic update to the company’s traditional look. 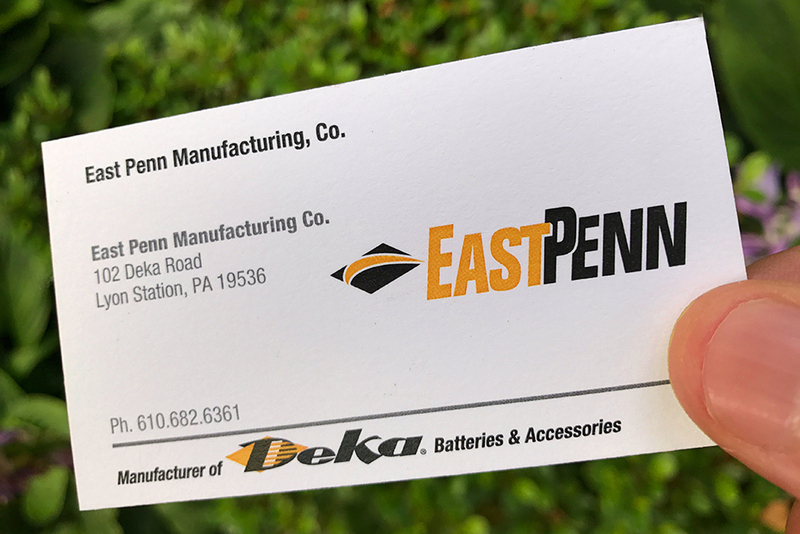 It also represents East Penn as the only manufacturer of the excellent Deka brand of products and incorporates other design elements to enhance its visual appeal. Soon after the logo design, East Penn introduced its “passion for power” essence statement. CLIENT SUSTAINABILITY: East Penn has a strong commitment to quality and environmental standards. East Penn’s entire 520-acre complex is certified to ISO 14001:2004 environmental standards. It is a leader with innovative recycling and in creating “clean, green” battery products. CLIENT NOTES: East Penn is a private, family-owned company operating the largest single-site, lead-acid battery manufacturing facility in the world. Its recognized brands include Deka, Intimidator and Fahrenheit. East Penn companies are East Penn International, East Penn Canada, Ecoult and MK Battery. Its more than 90 warehouses and distribution centers are located in North America, with more than 70 sales locations in the U.S., Canada and Mexico. Made in the U.S.